Making BBQ sauce is a tall task for any pit master. Everyone has their own preferences when it comes to the types of BBQ sauce they like, which makes it extremely difficult to get the flavor combinations that will please the masses. This is why most BBQ restaurants today now have an assortment of different styles of BBQ sauce for your choosing. 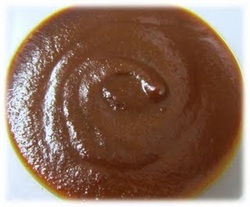 Popular styles of BBQ sauce are typically known by region such as Kansas City style, Memphis style, Texas style, Carolina style, or Alabama style. The recipe below is a Kansas City style BBQ sauce that is tomato and molasses based. In a blender or food processor, mix ketchup all of the BBQ sauce ingredients together until fully blended smooth. Bring the BBQ sauce mixture to a boil over medium heat in a saucepan, reduce heat to low, and simmer for about 1 hour.